You might be surprised to see a new look on this blog, even blogs need new outfits… I am currently working to improve my web savvy and for sure I need lots of help in that department. The crystals I often use to help me to stay less distracted has been my two Amethyst points that I keep by my computer. 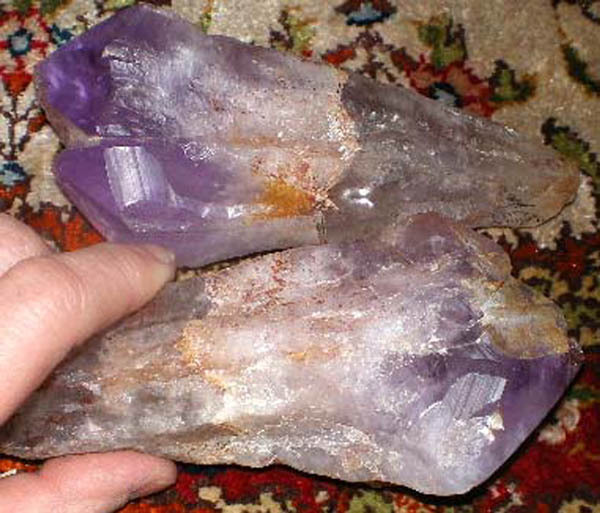 I just love Amethyst, and these two rare crystals in particular, 5″ and 6.5″ long teeth-like crystals are my preferred hand pieces. I just hold them to get clarity and the effect of more clarity and acceptance is palpable most immediately. Most of the time however, I just look at them briefly to re-adjust my eyes after looking at the computer screen, it relaxes my eyes as well. It is so soothing and helpful to me. You could try it too, and if you don’t have a crystal like this, you can just softly focus on the photograph of them and receive the same effect. The trick is use your mind and then close your eyes and visualize that you are holding them. This is a message from my friend Julei who created an amazing Gem Elixir, see details at the end of the message. It is also an invitation to a labyrinth walk on May 3, 2011 in Toronto. Join if you like! Welcome back! The earth seems to finally leaving winter snows behind so we can exit our hibernations. Hope this finds each of you surrounded by Love and Light. First, Isabel and I want to express what a pleasure it has been for the past few years to share these gatherings with all of you. The accumulated teachings revealed and energized by the spectrum of understandings and histories each of you brings have been inspiring to say the least. We are grateful to all beings who participated. Each event has been perfect in its actualization. Way back when Isabel and I started this journey together, it was because it “felt right” to do so. That feeling has only been deepened and reinforced since. We enjoy tremendous satisfaction and nourishment from being surrounded by such an incredible network of conscious, awakened beings. Thank you all! Across the world we are seeing the “communal heart” and “global consciousness” communicating the many ways to overcome ignorance, greed and ego’s illusions of separateness. The mediums are now the internet – YouTube – global cellular networks — GPS locators. These are the “Aquarian age technologies” predicted long ago to enable a “instantaneous, psychic connectivity of humans”. Those who brought that message may not have understood exactly what form that would take, but here it is! So what are we becoming aware of with these technologies? It is easy to be overwhelmed trying to ‘make sense’ of it all. Please keep your focus on revealing, naming and transforming all corrupted uses of power, resources and living energy. There is a lot of “spring cleaning” and redistribution of resources to provide for and uplift as many sentient beings as possible. As always, all “work” begins first and foremost with what we are each willing to do and be accountable for on a personal scale. What does that look like for you? 2011 began with a very different quality of energy and message. In its roots is the reminder that we are always immersed in the richness of our innate wisdoms and at every moment have the potential to reawaken that. How does your garden grow? What deeply nourishes you and opens you to embodying the divine and sacred as you experience that? ~ a time for reflection and gratitude on what has been achieved on every level of your soul. ~ a time to deeply recognize that which is ending/closing/leaving/completing and finding ways to embody that in serenity and peace. ~ a time to acknowledge how you are choosing to take your power as a conscious spiritual being and making that so in every moment. ~ a time to walk beside others to honour their unique paths in unity, gratitude and respect for all the ways there are to be. ~ a time to explore spring cleansing at all the levels you are working to prepare your personal “garden” for the next growing season. The essence of the 2011 message is that you already have access to the optimal tools, experiences, teachings and resources to evolve in alignment with your soul purpose. Yes! Really! No need to rush around searching for something different, the right teacher, the right paradigm, the right place. Review what you have already gathered in your tool kit and relax — those tools work. In fact, all tools work if you let them. That is why there is so many paths up that mountain. Feelings of restlessness and urgency now may be about taking the work to the next level. Give yourself the gift of taking it deeper HERE and NOW. Through the gate of the May New Moon, in tune with the uprising energies of spring and the awakening rejuvenation of our earthly bodies, we invite all those who want to co-create this gathering to walk the High Park Labyrinth on May 3, 2011. We will be onsite between 5:30 and 7:30 pm – come walk amongst the gift and grace of common purpose. This is a “non-denominational” gathering so bring your own tools, your own nourishment and gather as equals. As always, we recognize there are many ways to celebrate and walk the spiritual path. Honour what calls you. Find your bliss and move it, move it! I am particularly excited about the message that came through this past winter’s solar and lunar eclipses and planetary alignments to the galactic center. I am grateful to all who helped manifest the message as a Crystal Mandala with its corresponding Gem Elixir. Photos of that two month process will be posted soon — it has been percolating pending completion of the winter snows! The potentized elixir, guidelines for its use and a copy of the crystal message statement will be available for $20 from Julei. Please email me at birthpassages@rogers.com if you are interested. I look forward to promoting and supporting the diversity of events many of you continue to generate. Please let me know what you are doing and whether you wanted the word spread. Influence your mind the prosperity way! – How to Use Healing Images of Crystals! Competent healers use crystals like tuning forks to affect the imbalances we all have in the body. The vibrational signatures of crystals can help you as well, in a meditation or healing session for health, emotional freedom or prosperity. A crystal layout is providing a combined signature vibration of all the stones used in that layout. If you take an intentional picture of this layout, you can use the picture as the tool or target to magnetize your healing or meditation. The picture contains a complex signature that you want to use for your own healing. Images are powerful! Just look to advertising, they transmit energy signatures that trigger you to respond. If you are aware of it, great! If you are not, well look out, because it will direct your actions subconsciously. And that is what an advertiser’s goal is! You may use the Tarot already to find answers to personal questions. Originally Tarot was a way with which the Egyptian or other ancient traditions shared archetypal wisdom. A practical example would be discovering how some of your beliefs and desires influence you to behave and decide in ways that perhaps do not serve you. When I am must make a decision, or have a question about my life. I can use the ”The Crystal Lotus Tarot” to clarify my options. By meditating with the card I pick, I give myself an energetic boost (crystal energy signature) and some time to process. The result is better informed answers that resonate stronger to the core or my heart. PS. For those of you in Toronto, I will bring a few copies to my crystal talk Saturday March 19th (It is the Full Moon!) at Odyssey Books and Gifts. See us also at the Body Mind and Spirit Expo March 25-27, 2011. Archetype is defined as group of behavioral patterns (thought form patterns) that manifests as our persona or personality types to be worked out in this life time. Arcana means archetype, and in the Tarot designate the 22 Major Arcana. They are the energetic signatures that the universe provides for you – your gifts and challenges. You must work with them on daily basis in the most skilful way you can. When you know what is coming your way you can make better choices. It is one of the simplest guide tools available. (The Minor Arcana on the other hand has more to do with the nitty-gritty details of interactions, persons and your personal preferences). Crystal Spheres are ideal for massage as they provide both energy and safe, gentle touch. Sphere Massage is an ideal activity for total relaxation. Imagine getting a professional massage for yourself. Beginning with your hands, you may use a small sphere and move it over the entire area of your palms. If you move with tiny circular movements you may affect the tiny reflex points that are located in the palms and fingers. These reflex points are connected with all the organs in your body. By touching the reflex points you can harmonise energy blockages, then you body have a chance to balance and heal. Crystal Sphere massage can be applied to the head and the neck. And while waiting in the dentist’s office you may use a small sphere to ease tensions and possible anxious feelings. This is very helpful for you to be in a calm state during any medical procedure. A larger sphere can be used on legs and muscle areas and a smaller one for the hands and head. The type of sphere you use may also affect the area you are applying it to. A Rose Quartz is usually beneficial during emotional times and can be applied to tone your emotional body especially when applied around the heart and the rib cage. Crystal Touch as in sphere massage is described in detail in The Crystal Lotus Handbook and I will include more about how to do it for maximum effect in future post on the Crystal Dakini’s blog. Let me know if you have a particular question relating to Crystal Massage that can help others please share it. A Boeing 747-400 passenger jet can hold 416 passengers. This blog was viewed about 2,100 times in 2010. That’s about 5 full 747s. In 2010, there were 4 new posts, not bad for the first year! There were 18 pictures uploaded, taking up a total of 5mb. That’s about 2 pictures per month. The busiest day of the year was November 4th with 177 views. The most popular post that day was About “The Crystal Lotus Handbook” an Essential Guide to Crystals. The top referring sites in 2010 were thecrystallotus.com, mail.live.com, mail.yahoo.com, preventdisease.com, and facebook.com. Some visitors came searching, mostly for crystal dakini, crystal healing, crystaldakini.com, http://www.crystaldakini.com, and crystal talisman. How do we affect our lives to the better? There are lots of methods we can use from meditation to medication and applying various therapies. We may also attempt to remedy our condition with a conscious choice of intention, and take charge of our life with appropriate action to create a happier life for ourselves. I feel this option is most ideal. We reap the immediate benefits by feeling accomplished, healed or more empowered by our own effort. Crystal Healing Talisman, using "Birds Nest" Gem Weave. 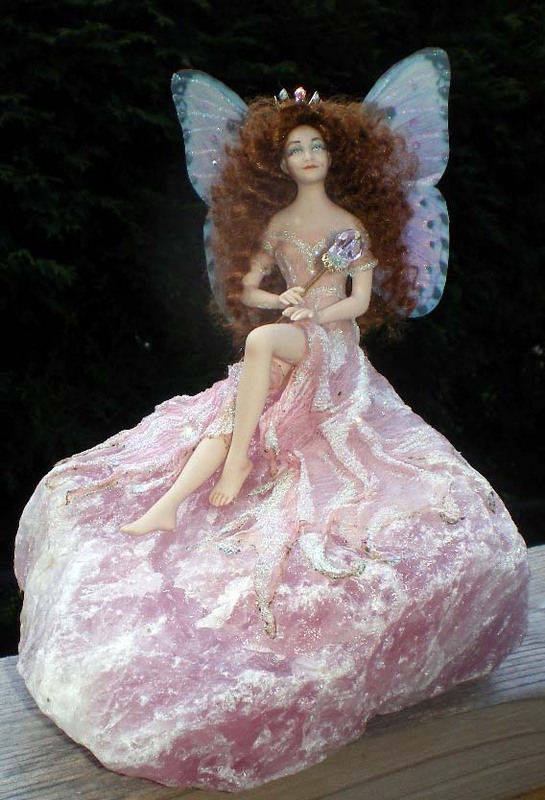 One way to address the myriads of problems we may have is to create a Crystal Healing Talisman, which is an object personally created using gemstones. Depending on which condition or situation you seek to address, you may choose one or more stones, gems or crystals and bind them together with string or wire. As most are not professional jewelers, I propose a method that anyone can use without hi-tech tools. It is called Gem Weaving. Regular wire wraps may also work but in the method I have taught we “weave our intention” as our work progress toward the finished project. The object then becomes a true Crystal Healing Talisman. Without healing intention we have only some stone wrapped with wire. Personal Crystal Healing Mandala Talisman. 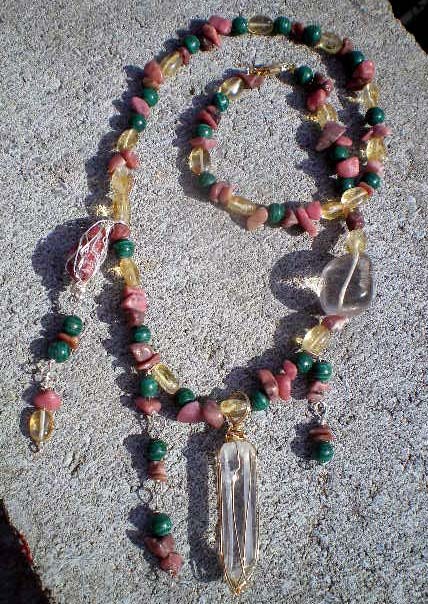 A Crystal Healing Talisman can include a simple pendant worn at the heart, or an entire necklace called Crystal Healing Mandala Talisman, both are used similarly with the difference of the focused personal intention. Crystal Healing Talismans as a single pendent is mostly used to address a specific problem or situation in contrast to the Crystal Healing Mandala Talisman, which is used to embrace a larger goal or vision for ourselves. 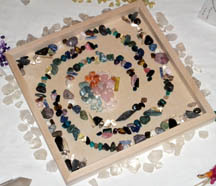 The Crystal Healing Mandala Talisman is best created by the person themselves as it is a very empowering process. An excellent example of a specialized crystal healing talisman is what I offer as a therapeutic session for clients: the “Crystal Color Life Spiral Talisman” that clients use for three months or more to gain regain balance. Learn more about how to receive a “Crystal Color Life Spiral” or create Crystal Healing Jewelry by visiting the their pages on this site. 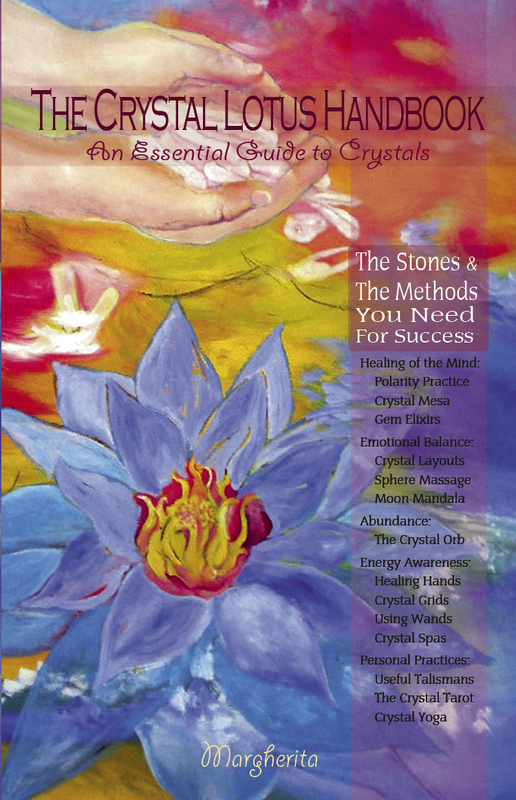 You can also read more about Crystal Healing Talismans in the Crystal Lotus Handbook.